Our premium baseball predictions are only available by subscription for the low monthly price of just $99.95 – that’s less than $4.00 per day! During your subscription you will receive uninterrupted baseball picks every day from May to the end of MLB regular season. A tremendous value consider the rates of some of our competitors! Each day we analyze all Major League Baseball games using our proprietary handicapping formulas that have been developed over the years. Our handicapping systems incorporate pattern analysis, statistical trends, power matchups and more to find the most value in any given game. 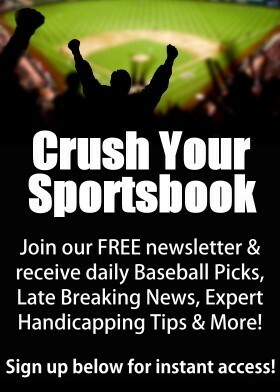 As a subscriber, you’ll have access our members area where you can view these daily baseball picks. We break our predictions into daytime and nighttime plays so that we can include the latest information available in our handicapping analysis. Baseball news like player player injuries, pitcher matchups, scheduled umpires, changing weather conditions, and more. But don’t worry, we release all of our predictions with plenty of time for you to use our information. Historically, we’ve provided anywhere from 300 to 500 baseball predictions throughout the regular season. The quantity of the selections depends on the matchups and every season is different, but as a customer I think your more interested in quality. We will not win every game, but at the end of regular season play we have historically had more winners than losers returning our clients a consistent profit. Our premium picks are normally released beginning fourth week of regular season play (but don’t worry – we will not start billing you account til May 1st!). This time frame allows us to track pitcher performance during both home and away games, analyze team performance, and build our database. Prior to releasing picks, we will release our opinions that have been analyzed using our methods but without the depth of data we do not consider them picks or predictions. Our baseball prediction service will also include game “Totals,” also know as “Over/Under” selections. When we release our “Totals” predictions, we will include the moneyline and runline that we utilized during our analysis. The same rules apply to the moneyline as stated in the previous paragraph, however, you must pay strict attention to the posted runline. If the runline is different than the runline we posted in our selection – never place an investment on a higher runline. For example: if our prediction is to take Over 7 runs and your sportsbook is offering 7.5 runs – do NOT make the investment. However, if your sportsbook is offering 6.5 runs – DO make the investment. The same is true for the reverse or Under selections, just never place an investment on a higher number. Don’t worry if some of our advice is canceled due to line changes against you. It will happen. The important thing to remember is be patient and stay disciplined. There will be plenty of action available for you throughout the season. No pressure, hype, or hassles – If you don’t like our baseball predictions or you are simply unhappy with our service, you are free to cancel your subscription at any time… No questions asked and without penalty.